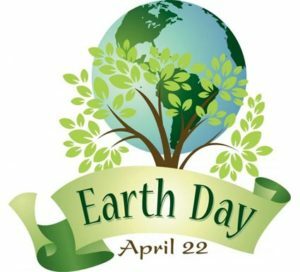 Today marks the 48th birthday of Earth Day. Sometimes I wonder if there’s anything little old me can do to help save this amazing rock we live on. I can’t make free birth control available to those who need it, even though—in anyone’s mind–seven billion people on one planet is more than enough. I can’t stop the dumping of garbage and raw sewage into the earth’s waterways. I have no say-so in how much particulate matter refurbished diesel engines are allowed to emit into the atmosphere. –We can curtail our use of disposables, including dishes, eating utensils, coffee cups, water bottles, drinking straws and to-go containers. –We can ease up on the gas pedal and make sure our tires are properly inflated. –We can use natural cleaning products—vinegar, baking soda, salt, lemon juice and good old elbow grease—whenever possible. –We can take shorter showers and combine laundry into as few loads as possible. –We can refuse to litter, and we can pick up litter that the jerks throw down. –We can compost, which may mean nothing more than digging a hole in the backyard and filling it with apple cores and coffee grounds and banana peels and egg shells and orange rinds and most every other plant-based food so that it stays out of the landfill. –We can stop using plastic grocery bags. –We can pay bills online. –We can embrace a use-it-up, wear-it-out lifestyle. –We can open the windows instead of turning on the air conditioner the first time we break a sweat. –We can spay and neuter our pets. –We can contribute our money and time to organizations that promote environmental responsibility. –We can support businesses that demonstrate environmental responsibility. –We can put unrelenting pressure on policymakers to make the environment a top priority. –We can vote environmentally irresponsible lawmakers out of office and replace them with environmentally responsible ones. Every one of us can do just a little to help save this precious planet. And when a whole lot of people do just a little, the sky’s the limit on what we can accomplish. Happy Earth Day!